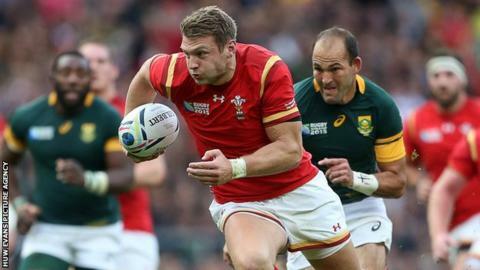 Wales fly-half Dan Biggar says he is learning to cope with the pressure of wearing the famous number 10 jersey. Biggar, 26, has established himself as Wales' first choice fly-half and starts in the Six Nations opener in Ireland at the Aviva Stadium on Sunday. The Ospreys player is well aware of Wales' fly-half heritage. "A lot more is expected of you. The pressure is difficult because the focus on 10 in Wales is 10 times more than any other position," he told 5 live. "It's nice when things are going well and it's a pretty difficult position when you lose or don't quite fire on all cylinders. "When I was younger I would go in on days off and look at kicking and extra patterns but as I've got a little bit older those days are so important to relax and get away from rugby." Biggar follows in a distinguished line of Welsh fly-halves including the likes of Cliff Morgan, Barry John, Phil Bennett, Jonathan Davies and Neil Jenkins. Biggar made his senior debut as a 19-year-old against Canada in November 2008 but did not cement his place as Wales' first choice fly-half until six years later. His performances at the 2015 World Cup, in which Wales reached the quarter-finals, enhanced his growing reputation. During the tournament Biggar's kicking routine became an internet sensation that gathered a cult following during the tournament. While Biggar's pre-kick routine differs from Jonny Wilkinson's trademark cupped hands, bottom out stance and stare, the Welshman revealed he learned a lot from the former England fly-half, who's late drop-goal helped England beat Australia in the final of the 2003 World Cup. "He started that obsessive routine of kicking and hours spent on the training field," Biggar added. "Every boy wanted to be him and every boy wanted to stay out last and come in last. "There's definitely a side of that in me but I'm also a little more laid back than what Jonny was in terms of being able to switch off a little bit. "As much as I'm a believer of you have to put the all the work in, you have to take a step back as well."